We understand that the notion of starting guitar lessons can be daunting. Perhaps you are afraid of learning and what your first lesson will be like. We can assure you that you do not need to be afraid or worried about learning the guitar. In the first lesson your teacher will get acquainted with your goals and guide you in learning how to play the guitar. We want to encourage you not to let fear stand in the way of what you hope to accomplish. Take the leap of faith – we promise to be patient and do our utmost to make you feel at home. Please note that you will lose a lot of time, money and potential if you get this aspect wrong. 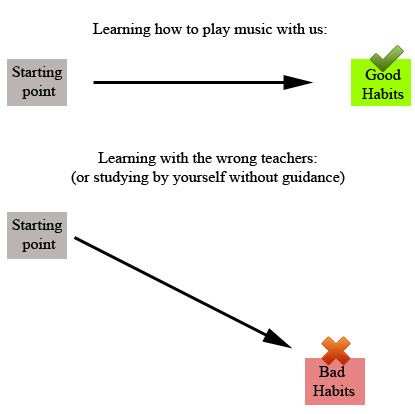 We’ve seen many many cases where individuals have started with the wrong teachers and had to re-learn their instrument. What a waste of time! You may be wondering what to do to get started. We would recommend you have a read through our guitar programs to find the most suitable course for your situation or view our correspondence guitar courses if your time is very limited and you cannot attend a guitar course in person.